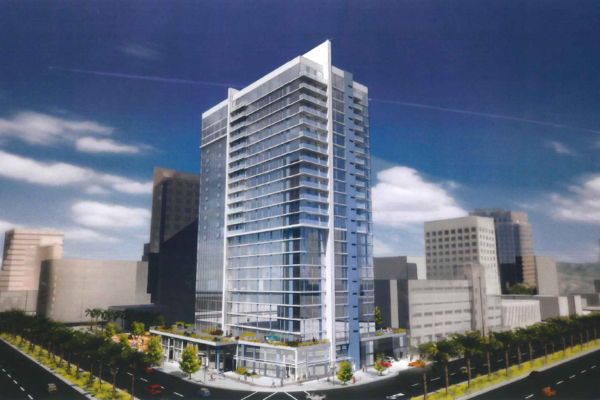 The San Jose Blog: KT Urban Planning Yet Another Tower Downtown! KT Urban Planning Yet Another Tower Downtown! Another day, another tower. KT Urban (formerly KT Properties) is the developer behind many of the best looking towers Downtown: Axis, One South, and soon Silvery Towers. In a huge vote of confidence for the Downtown residential market, they are now planning a 24-story 264 condo tower at the corner of Park Avenue and Almaden Boulevard. The ground floor would have 7,700 SQFT of retail and there would be five levels of parking (three would be underground). The proposed tower would be situated across the street from Adobe and in the corner of Park Center Plaza, where an ugly dilapidated court building currently sits. While there is not a ton going on for residents in that block (besides Specialties), when you move out two and three blocks you have access to all of the amenities in central Downtown. San Pedro Square is a 5 minute walk in one direction and and SoFA is a 5 minute walk in the other. While there has been a lot of debate on saving this location for an office building, I really think in order to get maximum vibrancy throughout the day and night we should try to blend residential, office, and retail as much as possible Downtown. We still have tons of parcels where we can build office projects--heck, most of Park City Plaza could be torn down and replaced with high-rise office buildings. The more projects we can push through during this boom cycle, the stronger Downtown will be years from now.